Through research of public records, we have confirmed that Chesapeake Energy is indeed the company that Lynden Energy Corp. and Crownquest leased a portion of the Mitchell Ranch to. Chesapeake applied and received permits for two vertical wells and three horizontal wells on their leased land. Recently, Chesapeake obtained a permit for a horizontal sidetrack well bore at the S250H location. 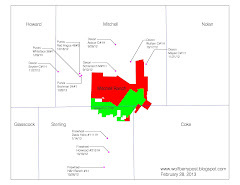 It appears that Chesapeake is actively drilling and spending a large sum on their wells at Mitchell Ranch!